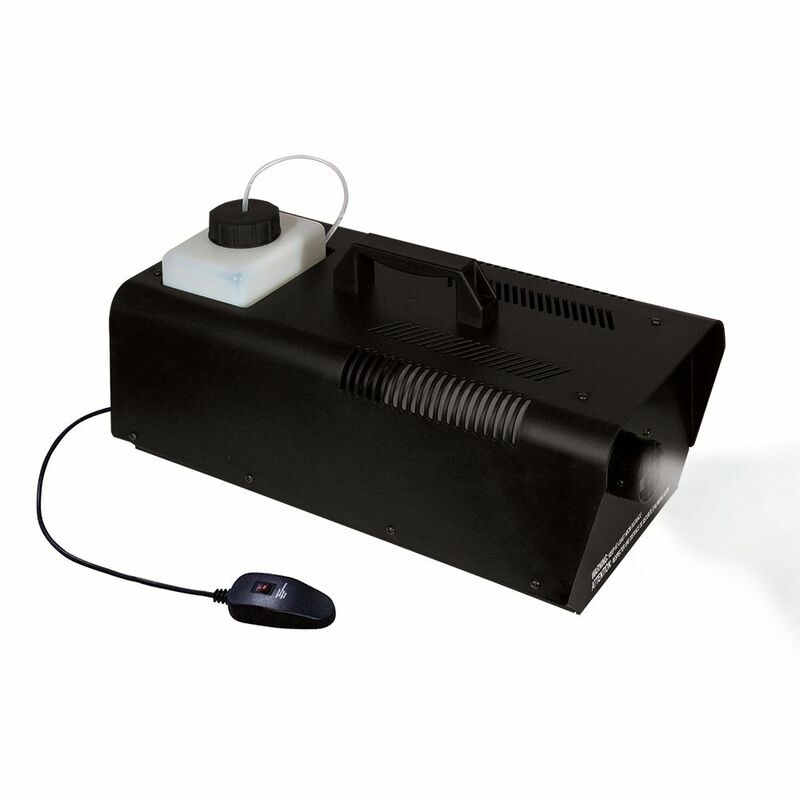 1000W Fog Machine with Wireless Remote Send shivers up your guests' spines this Halloween with this 1000 Watt Fog Machine! Produces a thick, non-toxic, water-based fog that is perfect for any party or haunted house. Features a durable metal case with handle for easy portability, and includes a wireless remote and transmitter set (transmitter & receiver). The sinister mist creates the perfect ambient setting for your haunted house or graveyard! 1000W Fog Machine with Wireless Remote is rated 3.9 out of 5 by 17. Rated 5 out of 5 by sinaminn from Put it on a timer and stuck in our chiller. It oozed fog over our cemetery for nearly 4 hours and... Put it on a timer and stuck in our chiller. It oozed fog over our cemetery for nearly 4 hours and still had juice left to burn. Worked great! Rated 3 out of 5 by RhythmFog from Overall made of plastic. Fog not thick enough. It works outdoors as long as it doesn't rain. OVER... Overall made of plastic. Fog not thick enough. It works outdoors as long as it doesn't rain. OVERALL it's pretty good for basics. Rated 5 out of 5 by Gary from Worked great. ... Worked great. Rated 1 out of 5 by Melanie from If I could give a 0 I would Maybe we were just unlucky but on Halloween night we opened up the box to this dog machine and set it all up. We could t wait to use it and it didn’t work. What a disappointment. We should have tested it before hand but unfortunately we just assumed it would work. Now all the stores are sold out and I am not sure they will let us return it after Halloween. Rated 5 out of 5 by Danielle from amazing! It produced thick low lying fog with the help of ice and dry ice. Our Halloween was a success thankfully to this machine. It keeps running on it's own so no need to have to keep pushing a button.